Browse: Home / MEM64 – Memory Only Payload With HTA Attack Vector. 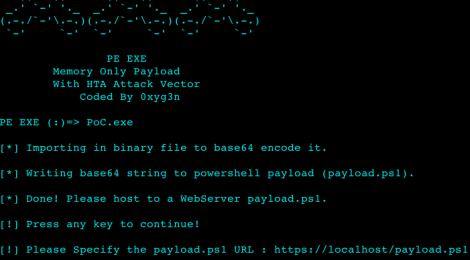 MEM64 is a script Run Any Native PE file as a memory ONLY Payload , most likely as a shellcode using hta attack vector which interacts with Powershell. – This Software allows you to run directly to memory every Native PE file . – It interacts with powershell via HTA attack vector. – The best way to achieve infecting your victim is Social Engineering. ← The Sentinel Project – Collection of python scripts to security auditing/Penetration Tester & Security Researchers.